Melt, an environmentally sensitive two day installation involving a politically dynamic sextet of books selected and amended according to their content. Each book incised with text, such as the words JUST/ICE paired with Tom Maloney’s U.S. Camera ’62, ICE/CAP with The National Geographic Society’s As We Live We Breath, and corresponding to Alfred Knoff’s Arsenals of Foley are inscribed the words RED/ACT. 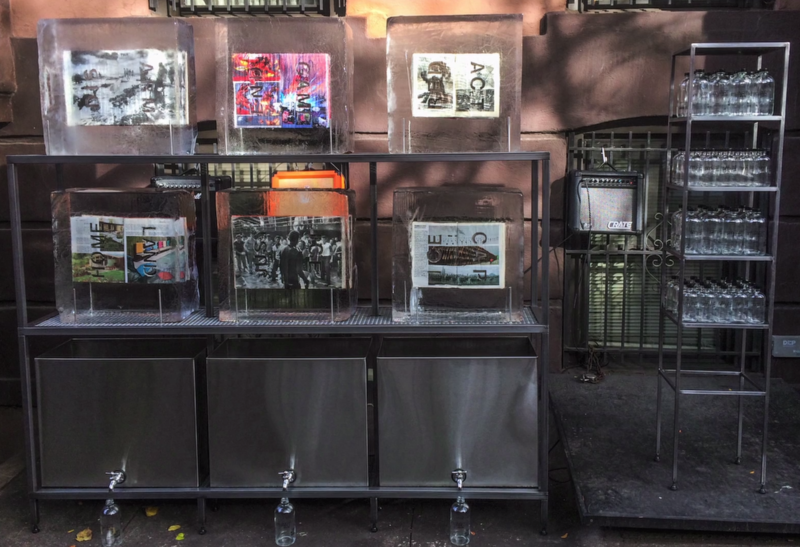 The frozen books are housed in a steel frame alongside an audio component registered to make live a global and personal transformation and meltdown. The ice run-off is then bottled and branded sm/ART Water. This new installation animates Beube’s dialogue of socio-political conditions, cultures of violence both physical and psychological, and those structures existing to support the inverse of the latter.